Reminds me of some of the relatively early "Elephant semifics" output discussed here on Language Log. The system has clearly been infected with the Gertrude Stein virus. I especially loved how "One Belt One Road" was translated into Chinese as "“一条公路一条腰带”, basically meaning "One Road One Waistband" ! The Boao Forum is the biggest event of the year here in Hainan, and President Xi came down again this year to give the keynote address, so it really is not a place you want to fail! Speaking of Hainan, the province is in the middle of 30th anniversary celebrations, so happy birthday Hainan! It does feel a bit odd to have more birthdays personally than the place I live, to be sure. Thanks for the actual "chuckle out loud". Proves people are no more needed for producing cromulent texts. Neither for reading them. This reminds me of Penn commmencement three years ago. Anything involving our president is designed to be flawless and what with the electoral nakba still in the future she was particularly genki bonding with the power women of the coming Hillary administration. The speeches were streamed live to the world also crawled on huge electronic displays. That was when I nearly collapsed. Someone was inputting in real time. The result was high tech hash and humiliation. Personal and place names misspelled. Indeed clearly unfamiliar. Grammatical breakdown. Most embarrassing: common English words turned into obscenities. Our message: Penn is the greatest BUT we don’t know English. The Gertrude Stein virus alas. 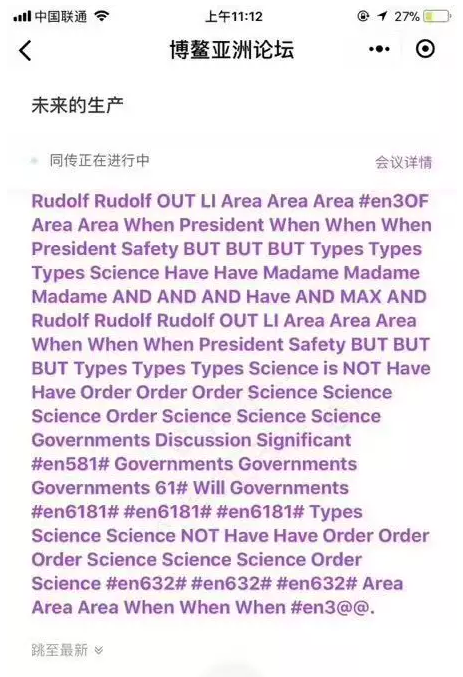 Madame Rudolf blinded area with science. Science! Google translate does a poor job translating TCM. It isn't programmed for TCM, nor for Literary Sinitic / Classical, nor for Middle Vernacular Sinitic, nor for Buddhist Hybrid Sinitic, nor for Shanginese, nor for Sichuanese…. I like it. It has a sort of early 80s sound to it. RUDOLF RUDOLF RUDOLF! OUT OUT OUT! And I like "One Road One Waistband". Depending on the style of the waistband you could even go for One Highway, One Low-Rise. This system was providing both speech recognition and translation on the fly — far more difficult than text-to-text translation, since errors in the speech recognition phase will be multiplied in the translation phase. Plus, the speakers must have been speaking English with various accents and Mandarin with various accents. 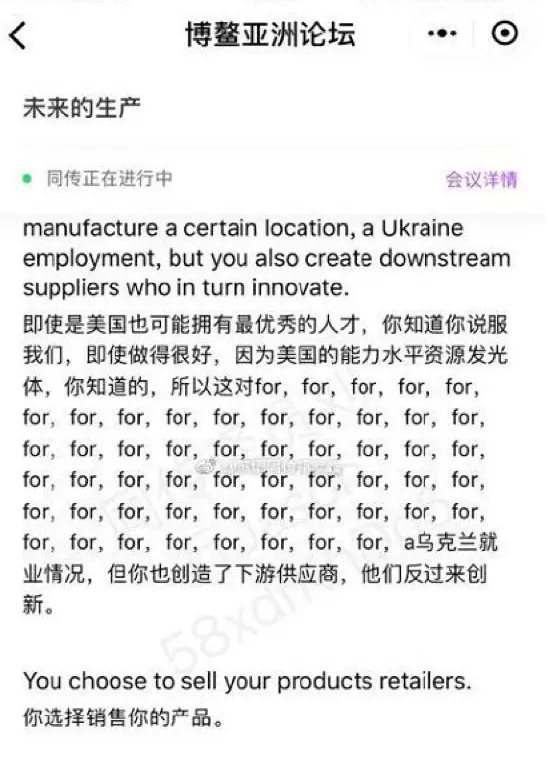 That second screenshot is obviously an English transcription error: "a Ukraine employment" should have been "you create employment". Was it the ungrammatical English input that made the Chinese translation blow up? Yes, I think that was a big part of it. I did see one comment blaming an English speaker for saying Road and Belt (instead of the expected Belt and Road) which resulted in the whole "waistband" mistranslation in Chinese. I ran the source article through Google Translate, and at one point it said this was an "oolong event" (乌龙事件). Oolong? They were drinking tea? A little more searching led me to believe it's an idiom meaning something like "own goal", maybe even a Chinese transcription of "own goal". It would be interesting to learn more about this phrase and where it comes from.